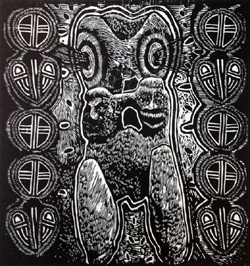 I wanted to make you aware of an opportunity to purchase my woodcut print entitled Pensamiento Taíno, 2013. I have produced a special addition of 50 Pensamiento Taíno prints, originally created for the print portfolio, Posada: 100 years legacy, celebrating the Mexican artist José Guadalupe Posada. Pensamiento Taíno, on display at La Fonda Restaurant and Tapa Bar, 169 East 106th between Lexington and Third Avenues, can also be viewed at my studio 1690 Lexington Ave 4th floor. For those of you who may have been wondering, all my artwork on exhibit at La Fonda is for sale. You can contact me at diogenes_studio@yahoo.com or call me at (646) 648-1257 if you are interested in purchasing Pensamiento Taíno or other of my pieces. I am selling the print, Pensamiento Taíno for $800. It is a perfect gift for a loved one or yourself for the holidays. Besides obtaining affordable art, you will be supporting the development of a building project in La Playa de Ponce Porto Rico that will include my studio and an artist in residence, which will be available for artists from the U.S. and other countries to live and work in La Playa during a residency.